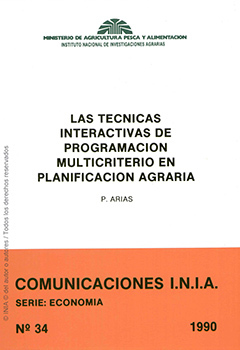 Affiliation: Departamento de Economía y Ciencias Sociales Agrarias. E.T.S.I.A. (UPM). Madrid. The aim of this issue is to propose alternative crops plants in irrigated farms for La Campiña (Guadalajara. Spain). A decisional model with four objectives (risk, gross margin, employment and mechanization) and ninety nine constraints is proposed. The interactive multicriteria methods which have been examined are: STEM, Displaced Ideal, Geoffrion et al. (G.D.F. ), Belenson-Kapur, Zionts-Wallenius, Steuer, Surrogado (S.W.T. ), Satisfactory goals, Interactive Sequential Goal Programming (I.S.G.P. ), and Interactive Multiple Goal Programming (I.M.G.P.). These methods are applied to different farm sizes. Physical Description : 130p. ; 17X24.